A bathroom is one of the most valued and utilized rooms in a house. Accordingly, choosing to remodel your bathroom is a great project for increasing the value of your home. Though for many homeowners they do not know where to begin in a bathroom remodeling project. A bathroom remodeling checklist can help. A bathroom remodeling checklist provides a plan and schedule for successfully tackling a bathroom remodeling project. With paper and pen, you can quickly begin to create your own bathroom remodeling checklist. 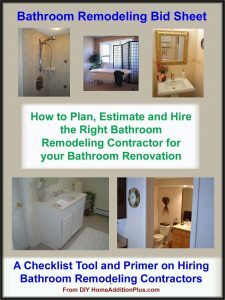 The process of creating a bathroom remodeling checklist is in essences, the conversion of a series of questions into an outline to form a plan of action. By going through this process you can create your own complete bathroom remodeling checklist and improve the likelihood of success in your bathroom remodeling endeavors. To help you get started in developing your own bathroom remodeling checklist, I have summarize below the high level items that you should include in your bathroom remodeling checklist. Keep in mind that this is only a high level checklist, and that there are many more details that you will need to fill in to complete your own bathroom remodeling checklist. Presuming you do not plan to pay cash for your bathroom remodeling project, you will need to obtain financing. Visit a few local banks to understand your loan options and to determine how much you can borrow. With a better understanding of the funds you can borrow, you can establish a baseline bathroom remodeling budget. Assess your bathroom remodeling goals within the context and confines of your existing bathroom space. For example, is the bathroom area large enough to support a large Jacuzzi tub, and/or a separate custom ceramic tile shower? Write down your bathroom remodeling design goals so that you can share them with either an architect or a bathroom designer. They can also help evaluate your bathroom remodeling options to see what is feasible. Depending upon the complexity of your bathroom remodeling project you may need to employ the services of an architect. If you plan to move walls, and change electrical outlet and fixture locations, you will more than likely need to hire one. If, on the other hand, your bathroom remodeling project simply involves replacing the bathroom vanity, flooring and wall coverings you may be able to get away with just your own bathroom design skills. Again, if your bathroom remodeling project involves moving walls, and electrical and plumbing fixtures, then you will most likely need to hire a bathroom remodeling contractor. 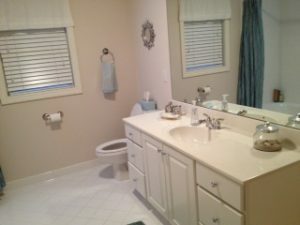 Use your bathroom remodeling plans to meet with prospective bathroom remodeling contractors and obtain contractor bids. Make sure you take the time and effort to carefully review each bathroom remodeling contractor bid to determine which contractor is right for your bathroom remodeling project. Once you have identified your bathroom remodeling contractor and have a formal cost estimate you can then complete the process of obtaining financing. With a bathroom remodeling project you may or may not need to pull permits. It depends upon the complexity of the remodeling project and what contractor trades are required. Again, if you are moving walls, changing/adding electrical outlets and plumbing fixtures you will indeed need to pull permits. Once you have your bathroom remodeling permits in hand you are ready to begin the first step of your bathroom remodeling project, removing the existing bathroom fixtures. Depending upon what you negotiated with your bathroom remodeling contractor you may, or may not, have to do this work yourself. After removing the existing bathroom fixtures the real remodeling work can begin. Start and completion dates for the bathroom remodeling work should have been included in the construction timeline provided by your contractor. Presuming you are living in the home throughout the bathroom remodeling effort, it will be fairly easy to monitor your contractor’s performance and craftsmanship. If you see issues, make sure you promptly bring them to the attention of your contractor. Holding off telling the contractor about an issue will only cost you more money and aggravation in the end. Do not, though, constantly pepper your contractor with questions and petty issues. This is the fastest way to see your contractor walk off the job, which will inevitably lead to cost overruns and delays. To put it succinctly, make sure the contractor is remodeling your bathroom to plans, period. If permits are required in your bathroom remodeling project, make sure that upon completion of major milestones, e.g. the rough in of new plumbing, that either you or the remodeling contractor contact the building inspector to arrange for an inspection. If there were permits pulled, once the bathroom remodeling project is complete have the building inspector come in to make the final inspection and approve of the work. With the final inspection complete, your newly remodeled bathroom is ready for use. It is important to remember that this is a summary bathroom remodeling checklist. There are many other detailed steps along the way that will need to be taken into consideration depending upon your unique bathroom remodeling requirements. For example, if your bathroom remodeling plans call for a Jacuzzi tub, the installation of larger supply line pipes will most likely be required. This type of issue needs to be addressed early so that new supply lines can be snaked up from the lower levels of the home. For help on your bathroom remodeling project, see my Bathroom Remodeling Bid Sheet. The Bathroom Remodeling Bid Sheet provides a request for quote checklist section that you can provide to prospective bathroom remodeling contractors. It also includes a comprehensive bathroom remodeling cost breakdown table, in Microsoft Excel format, that allows the contractor to include his projected remodeling costs for every phase of the project. Get Free Bathroom Remodeling Price Quotes with No Obligation! Fill out our 3-5 minute quick and easy form, and receive a free price quote on bathroom remodeling from one of our prescreened and licensed bathroom remodeling contractors. This process is free and there is no obligation to continue once you receive your bathroom renovation price estimate.